I have always been fascinated by nature. Growing up in Oregon afforded me the opportunity to appreciate and absorb the beauty, complexity, and grandeur of the land. As an artist, I am drawn to painting images of the natural world that capture my imagination and my respect. I have painted since childhood and my style and technique has evolved through the years. As a painting conservator, I've had the added opportunity to carefully scrutinize and evaluate the working methods of the masters of the 19th and 20th Centuries. This study has certainly influenced and aided my growth as an artist, and has allowed me to more precisely achieve the results I desire in my personal creative efforts. My objective as a landscape painter is to create realistic images of nature that go beyond the mere description of a scene. It is my intent to capture the atmospheric quality of a particular location and to impart that sense of a special place and time. For the last ten years, the focus of my work has been the rural landscape of the Connecticut Litchfield hills. Some of these locations I am fortunate enough to pass by often and am reminded why I have chosen to live in this beautiful place. Tom Yost was born and raised in the greater Portland, Oregon, area. Attending parochial and public schools he was fortunate in receiving a well-rounded education which included art history as well as practical classes in fine art. From an early age Tom drew and painted surrounded by his creative siblings. An athlete, honor student and already an accomplished painter he attended Oregon State University and graduated with a degree in geology. His studies led him to a profession in the oil industry and a fascinating decade with an international oil company. In the corporate world he moved up rapidly in the ranks as an exploration geologist. Although he felt a job in the corporate world would be secure and lucrative he never lost his desire to pursue a life and career in the fine arts. In 1988 Tom moved to New York City to apprentice with his brother Jim in his sibling’s well established art conservation business. Here Tom’s years of painting prepared him to practice many of the essentials required in fine art restoration. Moreover, his background in science brought to his work a complementary degree of sophistication and expertise in this highly technical as well as artistically challenging arena of conservation. Tom opened his own studio, Yost Painting Restoration in New York in 1990. Tom and his staff of trained professionals and apprentices soon built a prestigious client list which included well known galleries, museums and art dealers from across the nation as well as many private art collectors. Relocating his base to Connecticut in 1998, he continued doing business as Yost Conservation LLC. Throughout his formative years, and during the professional years of his adulthood, Tom has always created time to make his own paintings. Undoubtedly working on so many great masterpieces has had its influence on Tom’s own style. 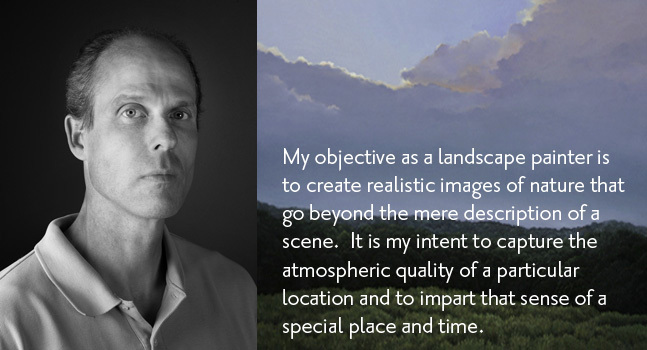 He continues to explore the countryside in Litchfield County Connecticut and produce works that capture the natural beauty and moments of inspiration found in Connecticut's landscape. Recognized by juried awards, Tom's highly regarded realism and carefully crafted images reflect the refinement and skill of an emerging American master.